New Year's Eve 2009 and we were rocking out at Puffy's house in Miami. Diddy had a big bash for a lot of his close friends and family and he was in full blown host mode as usual. Our man Quincy was there making sure we had a good time. He was rocking his custom G-Shock by ZShock, we call the Q-Shock! 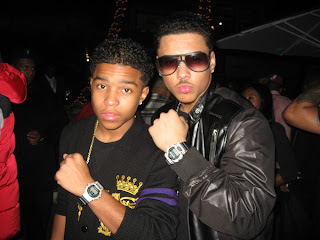 Not only was Q rocking an icy G-Shock, the younger Combs, Justin was also rocking his iced out G-Shock. This picture is classic. We had a great time and shout out to the Combs family for their great hospitality. Our man Big Sean's new video with Fly Dot U is bang'n. The song and the video have a real nice vibe. Even better yet, Big Sean is ZShock'n wearing his Diamond ZShock Premier Genesis and it's hit'n real hard in the video. Proof once again that the ZShocks travel in the best of cirlces. Jbar, the newest artist signed to Soulja Boy's SODMG label has a new song and with it a new music video called P's and Q's. JBAR has been a ZShock customer for a long time and once we heard his first song called DAZE, we knew this kid had a shot. Now with Soulja Boy's label behind him, we think we are going to see a lot more of JBAR. 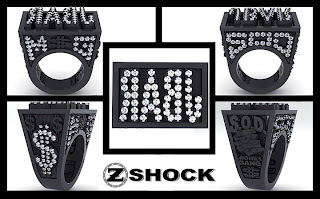 In this video you will see JBAR rock'n his ZShock Custom Punch Ring designed exclusively for him along with his ZShock watch. In addition, we send a big shout out to JBAR for referencing ZShock in his song at 59 seconds into the video. Good lookin out JBAR! After numerous requests for a ZShock give away or some type of contest to win a ZShock, the time has arrived. ZShock was looking to team up with the right partner and Global Grind is just the right fit. Effective today through Dec. 26 readers and subscribers of Global Grind will have an opportunity to enter the "Shining Moments" contest by entering a comment describing their Shining Moment of 2009 and win an iced out G-Shock by ZShock. There are two watches we are giving away, one for the gents and one for the ladies. We look for this to be the start of a great partership with Global Grind and the innaugural contest for many more to come from ZShock. 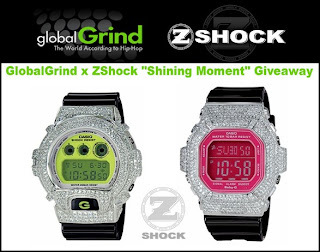 So, get over to Global Grind and enter the contest to win your very own iced out G-Shock by ZShock. As many already know our dude Omarion is already on Team ZShock. He reps us hard and owns more than one iced out G-Shock all by ZShock. His newest video for his song Hoodie has debuted and it is a banger. Omarion proves once again why he is a staple in this game. Shout out to our man Omarion for his talent, being consistent with bringing the jams and reppin ZShock.